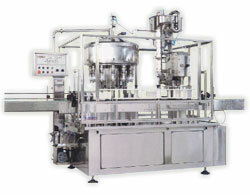 Filling system can be supplies in several versions depending on the product to be bottled. RF ’G’, gravity filler (for products of low viscous and flowable). Delivery of product into the central tank by means of a pump fitted with a solenoid valve. Capper can be adapted for all commercially available types of caps. Capper for applying screw caps with pre-threaded caps, safety caps, ROPP, plastic caps. Mechanical cap sorter fitted at top of covering sending cap through the feed chute to the capping head. An automatic rotary type with 4 heads screw-on capper specially designed for soft cork press-on caps. The whole capping system is supplied by AROL of Italy. Specially designed mechanical caps sorter assisted by pneumatic to sort the caps in the correct position and send through a stainless steel chute and to a specially designed head for ‘Pick & Place System’. 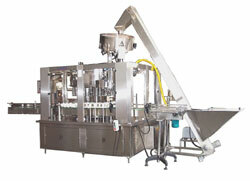 Capping head is driven by an electric motor and the descending movement is operated by cam system. Built-in ‘Pick & Place’ system for positive capping of soft cork press-on cap onto the bottle.